When you are feeling some kind of ups and downs a long the road of your educational journey, you need some motivation to help you keep going. 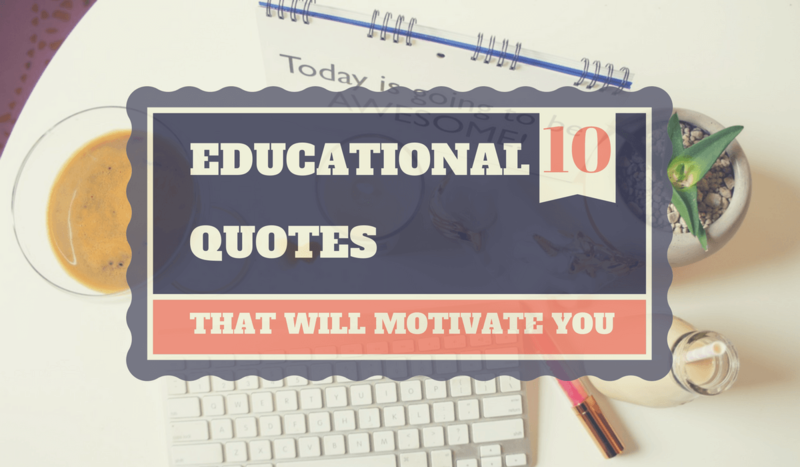 Here are ten education quotes that will motivate you and uplift your spirit in moving on. 1. “Develop a passion for learning. If you do, you will never cease to grow.” - Anthony J. D’Angelo. Just like everything else, you need to have a passion to driving your thirst for knowledge. Learning will never stop even after you graduate from college. You continue to build up your knowledge as you grow and mature. 2. “Education must simply teach work - it must teach life.” - W. E. B. Du Bois. Education is more than teaching you to get a job but also teaching you the life too. The term success will apply when you achieve both of them. That’s how education should be. Making mistakes is a part of learning. Don’t get discouraged when you experience a failure. Failure teaches you a way to be successful. After all, you become a student to learn and improve. Don’t let anything to stop you from learning. Education is created to serve everyone equally. However, when you educate women, you create ongoing investment for the future. It is something that benefits the generations to come in the long term. Reading is not something you can do in a rush. You need to read with an open mind and heart to allow your brain to absorb and understand what you are reading. Let your mind go to the deep place of thinking. It will help you gain powerful knowledge that will shape you and your future. To establish a standard of honesty and virtue in a person needs a good education to support it. Honesty is the first step towards learning and shaping personal characters positively. That’s like you learn from school. You learn from a teacher who knows more than you. And when you graduate, you can teach an individual who does not know more than you. It is not everything that you learn from school will be remembered, but anything that you remember is what matters the most. Education is the key to personal development and success. It is something that will benefit a person in the long run. No matter what you want to achieve, an education will guide you to where you are going to. Well, you can’t just tell anyone to do certain things without telling them the necessary information to support it. This how education comes to play. Education is the tool to convey, inform, teach and shape a person to the desired outcome. 10. “The function of education is to teach one to think intensively and to think critically. Intelligence plus character - that is the goal of true education.” - Martin Luther King, Jr.
You are not only learning to do things or feed you brain but also to think outside the box and be a good individual. You have to learn to develop a good character, not just the intelligence. We hope that these quotes are helpful to keep you motivated.